Magnetic stirrers at the ready proceed with caution ! seem’s like a simple method . Every example uses different ingredients ? I get the impression this is a confidential document. Curious as to how you acquired this. Or is it public domain? Once you apply for a patent it becomes public knowledge, that’s how patents work, how could you know if you where violating a patent if you couldn’t see if someone had already created something. That’s why allot of trade secrets are not patented. That way they can keep them secret. Look up any patients you want right here on the us patent office site. Sounds logical now. I guess I didn’t think this question thru before asking it. This was taken from an old vaping underground thread. I’ve been researching this because i’m seriously interested in trying it. The salt nic is made here using 100mg/ml freebase. Does Benzoic acid give off a taste? Every Juul flavor I tried gave off a similar taste. It’s pretty apparent in the Cool Cucumber and mint pods because they are light flavors… It’s not a bad taste. Just wondering if Benzoic acid is responsible it. There has been some suggestion that juul uses a mixture of method for their salt nic. The assumption would be that there are slightly differing factors according to the acid used to make the change…differences in absorption for example. I don’t know if you might have come across this sub already, but maybe it could contain some useful information about making your own salts. If not disregard my post. It’s certainly an interesting subject though and i’m definitely going to try out the process. Ultimately it would be nice to lower lung intake whilst still getting a good nicotine hit. I saw a statement about benzoic acid apparently it was chosen by Juul because of the amount of time it took to cross into the blood and reach the brain - it was significantly less than other acids and closest to analogues that they found. Thanks…yes I needed this confirmed. I had heard that the juul patent used a mixture of different acids to create a result that hit the blood brain barrier even quicker. It’s nice to know that the major player here is tthe benzoic acid though. Ok so i’ve ordered the benzoic acid and will make the salts as soon as I receive it. I’ll probably start a new thread to report back. Delivery estimates are around 3 weeks but its only coming from Poland to France so i’m expecting it a bit sooner. Could you tell me the name of the company? The seller is named chempl and is on ebay. He is based in Poland. Hope this helps. @woftam just reviewing this and wondering if you could let me have the source. There are some similar graph’s in the patent doc but they’re difficult to read. 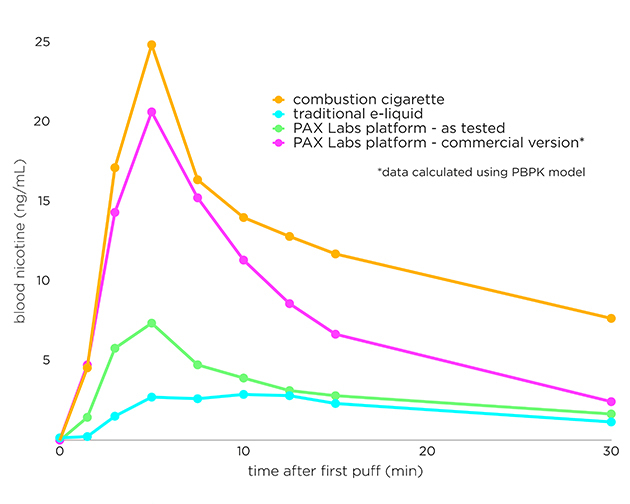 Specifically I am interested in the explanation for the Pax labs ‘tested’ as against ‘commercial’. If you know of any further info please let me know.